Make your own refreshing summer popsicles with My Lil Ice Pops Variety Packs! Perfect for teething toddlers or an afternoon treat, these pops are ideal for the whole family. You can fill each pop with fresh juices, ice cream, smoothies or yoghurts for a delicious homemade dessert. Refresh the atmosphere for your family members with some delicious icy treats. Check out our Pop recipe eBook for exciting ideas! Made out of durable 100% FDA approved food grade silicone in 80ml, they are reusable, easy to clean and dishwasher safe. You will save money and time by creating your own tasty ice pops. 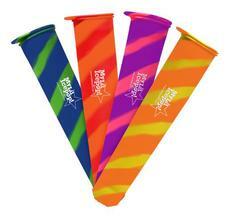 Being reusable, you can take advantage of an endless ice pop supply! Create fast, easy and delicious ice pops right from your own kitchen. The best solution for busy families: My Lil Pop reusable ice pop products are convenient, affordable and safe! Choose to be a parent that knows your children's tastes and make the ice pops according to everyone's preferences or dietary requirements! Convenient for growing kids and households on a budget, you'll want to use these ice pop makers every chance you get. Give yourself the chance of being the best host at your next summer party! There are endless possibilities for what to put inside your ice pops. Do you want to make a large batch? Simply double your recipe! You'll have enough to go around at the party and your guests are going to be delighted by the fresh flavours! Make different kinds and let everyone choose!